The online Merriam–Webster dictionary defines activism as “a doctrine or practice that emphasizes direct vigorous action especially in support of or opposition to one side of a controversial issue.” Political activism directs action toward creating change related to the making of government policy. Throughout this chapter we have discussed the requirement for nurse advocacy on behalf of patients. Our discussion of empowerment within the health care workplace suggests that there is also a need for advocacy on behalf of nurses to confirm their distinction as professional health care providers and knowledgeable patient advocates. 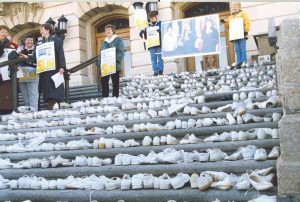 “99 Shoe Campaign, 1999” by the Saskatchewan Union of Nurses is licensed under a CC BY 4.0 International License. Advocating for the individual patient is an important part of ensuring quality health care. Nurses may respond to the social, political, and economic context of their environment to advocate for their patients and families through invisible political activism. This invisible activism is linked to strong partnerships with the public, local residents, government, and other power structures. Ongoing communication with community groups, including the government and media, is required to maintain these partnerships (Paterson, Duffet-Leger, & Cruttenden, 2009). This work of maintaining positive relationships with the community can remove the individual nurse from client-centred health care responsibilities. Therefore, it is important to consider that collective advocacy, through the auspices of professional associations and unions, can “extend the reach of individual nurses in order to address systemic problems in health care institutions and bureaucracies” (Mahlin, 2010, p. 247). Mahlin stresses that many of the difficulties faced by individual patients are the direct result of system-wide issues and problems related to inappropriate health resource allocation—such as costly medications that patients cannot afford after discharge from hospital—and inadequate and unsuitable levels of health care provider staffing. Taking action and finding solutions to these system issues are frequently beyond the reach of the individual nurse, but definitely within the scope of health care professional groups.